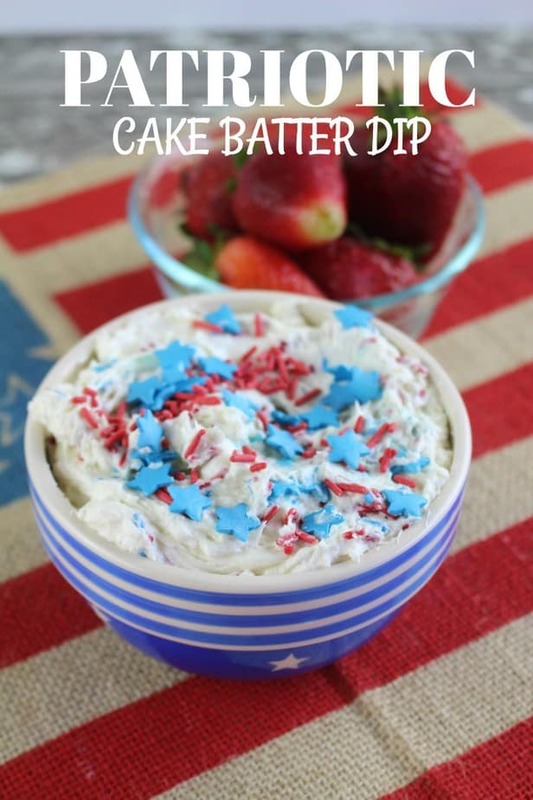 Summer is almost here and if you’re looking for an easy but delicious dessert to serve to family and friends, you’ll want to make this Patriotic Cake Batter Dip. It’s perfect to serve at BBQ’s this summer as your go-to dessert. The best thing is that it’s no trouble to make but so delicious (and addictive!) to eat! This one’s great for the kids to help with, which is HUGE in my house, because my kids always want to help. They can make this and have it look awesome without a lot of help or direction from ME! We’ll be bringing this to my sister’s house for a cookout on Sunday, after my niece’s baby shower (I’m going to be a great aunt AGAIN…how is that even possible???)! It’ll be really fun for the kids to enjoy and a nice festive addition to the table spread. Plus, what’s more fun than dip? In a bowl stir together cake mix, cream cheese and cool whip. Mix together until completely blended. You can whip with a hand blender if preferred! Stir in 1/2 cup of sprinkles. Transfer mix into a serving bowl and top with decorative sprinkles. Serve with strawberries or graham crackers! 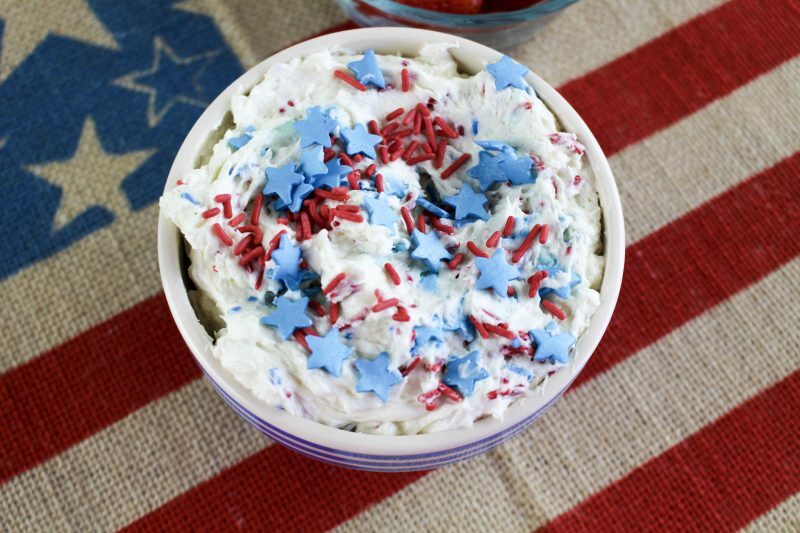 Can’t get enough of the patriotic foods? Try Layered 4th of July Mocktail, our always popular Patriotic Popcorn, Patriotic Triple Berry Layer Cake or our super simple fruit wands! This dip is looking colorful and delicious. Thanks for the recipe.